Whether you are looking for room darkening, translucency or sheer fabrics, Luxaflex® Roller Blinds are fully customised to your exact specifications and covered by a 5 year guarantee. Our Roller Blinds feature Child Safe systems including motorised systems, LiteRise®, Softraise, Nano, crank operation, chain tensioner. Stylish accessories To perfectly complement your style you can choose from a wide assortment of decorative trims, charming rings and glittering CRYSTALLIZED™ Swarovski crystal patterns. Beautiful trims and poles Choose from an eye catching selection of shapeswith or without poles, decorative bottom barsand braids. Create a sophisticated look with a braided trimin amatching colour or choose braids in acontrasting colour for a more playful appearance. 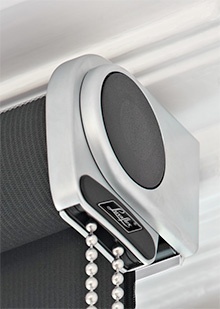 SoftRaise Luxaflex® SoftRaise allows you to operate your blind in a smooth and safe manner by simply pulling and releasing the pull attached to the bottom bar. This subtle ‘soft-raise’ relay mechanism eliminates the need for a control chain and offers a sleek look. Design Finish Offered exclusively by Luxaflex® is an award-winning design operating system, with pearl chrome finish and white, grey or black features, for ultimate comfort and style. Decorative bottom rail By default, the Luxaflex® Roller Blind executed with a covered bottom rail. For a surprising effect, you can also opt for a bottom rail in glossy white, aluminium, black laminate or stylish wood. Motorization Upgrade your roller blinds with our motorised operation. 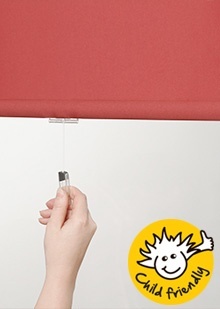 Raise and lower your blinds with a simple touch of a button. 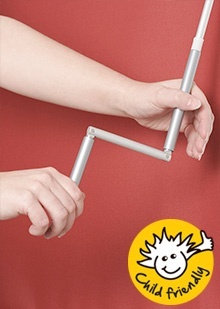 Operating hard to reach and large blinds has never been so easy and safe! Crank operation Many Luxaflex® products are available with a crank system. Luxaflex® Roller Blinds have been setting the trend in reinvigorating this classic, highly functional blind. The result? Roller Blinds are now quite literally “gallery quality” – suitable for any room or situation. There is a Luxaflex® Roller Blind certain to match your home and style. A Type 10 Roller is a standard roller supplied with mounting brackets. The brackets are supplied with white plastic covers. They can be top, side or face fitted. 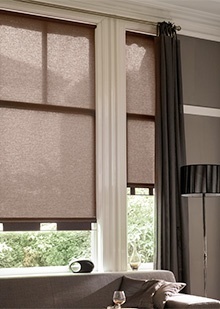 There is a wide selction of fabrics within the Luxaflex® range to suit all tastes. 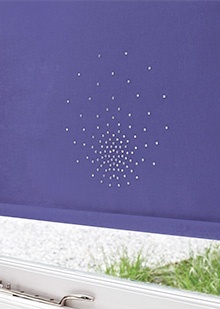 A variety of decorative finishes and trims are available to complete your blind design. A Type 20 roller has the roller and brackets premounted onto a mounting profile. This can be top or face fitted with clip in brackets at any point across the width. This makes it ideal for situations where fixing is not avaialble at the extreme ends or where adding additional brackets can overcome suspect fixing grounds. A Type 25 roller is where two rollers are mounted back to back on a mounting profile to allow the option of having two fabrics at one window, typically a Voile for daytime use and a an Opaque fabric for night. This option can only be Top fixed. A type 30 has the roller mounted in a stylish white cassette profile which hides aall the mechanisms. It can be face or top fixed. A Type 35 has the roller mounted in a cassette similar to a type 30. However the front and underside of the cassette is covered with the same fabric as the roller, the end caps will remain white. The XL roller range has been specially developed for larger window installtions. There is a choice of three tube sizes, 31, 37 & 50mm diameter. The sprung loaded bearing makes for easy installation. Alternative systems from simple brackets to fully enclosed cassettes, with side guiding cables or side channels measn there is an option for most installation requirements. The Luxaflex® Nano roller system consists of a small cassette that houses the roller which runs up side profiles. The whole mechanism is designed that it can be stuck to the glass of a window using 'click tape’ or can be screwed to the frame. It is particularly suitable for such things as tilt and turn windows. It is operated by hand or can be supplied with an operating pole for higher installations. For longer drop windows you will be supplied with two cassettes one top, one bottom. this allows for the build up of the longer drop of fabric, but also gives the flexilbility of operation that it can be stacked top or bottom.